Revised hp. Normally HP follows PS, but not this time. Nissan has released details about the 2012 Japan, 2013 US Nissan GT-R, with horsepower levels a little lower than has been speculated. 550 PS - ~545 horsepower for the 2013, up from 530 horsepower on the 2012, and up from 485 for the 2011, helps move the car down the road, and around the Nurburgring a little quicker. "2012 model accelerates 0-100km / h in two seconds Make It in one lap of the Nurburgring, Germany has a strength 7 minutes 20 seconds off. Not just go with 300km / h on the Autobahn, As the concept (the area its speed) is the car that can speed customers as Taming the life "
0-62 mph in 2.8 seconds. 400 meters- nearly a quarter mile in 10.? 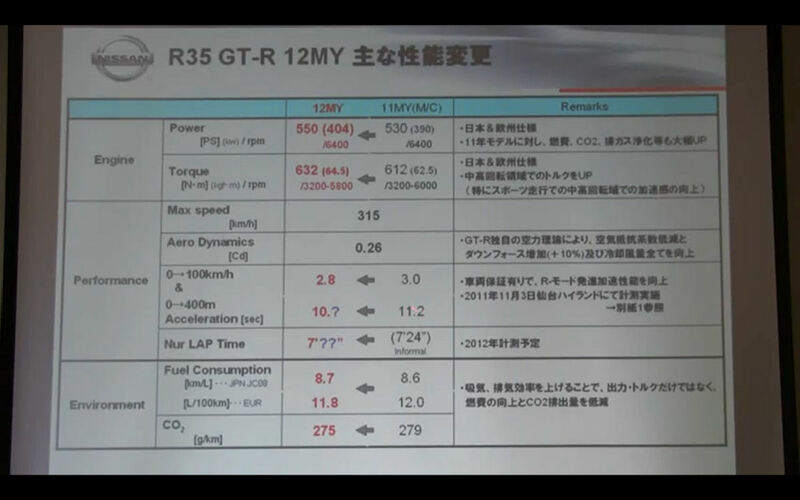 They also released some more details of the "Track Pack" version of the GT-R. This version which will probably not be released in the US, makes the car a more capable trackday weapon. With the improvement of this specification, GT and more Spartan-for driving customers to enjoy R, "For TRACK PACK" has been set. This consisted of customization options, only the suspension and forged wheels, brake cooling air guide in addition to, or for a lighter two-seater, has adopted a newly developed seats in the grip to hold the body of the driver seat cloth. Japanese video after the break.